Portfolio for Jira lets you share reports containing the read-only data of a plan or program — from both scope and schedule views. Reports contain dynamic data from your Jira instance. This means that the data you're sharing might not be the most updated from your Jira instance. The consumers of a shared report must have the necessary plan permissions and program permissions to view the report. Reports are shared from either the scope or schedule view. Consumers of the report will get the same view from which the report was shared. Consumers will be able to see and use the same filters, scheduling options, and other settings. When sharing a report, you can also include the controls and filters that are set up for the program. With controls and filters included, the consumer of the shared report is then able to change the schedule view option, hierarchy, and filters when viewing the report. 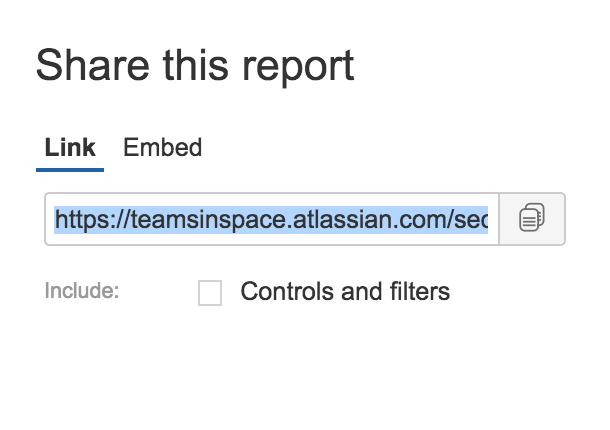 Before sharing a report, make sure you're logged into your Jira instance, and that you have the necessary Portfolio for Jira permissions, plan permissions, and program permissions. In Jira, go to Portfolio (in header) > View Portfolio . The 'Manage portfolio' page will be displayed. Depending on what you want to share, click your program or plan. Go to either the schedule or scope view of the program or plan. Choose how you want to share the report. You can customize the size by specifying the width and height in the iframe tag. 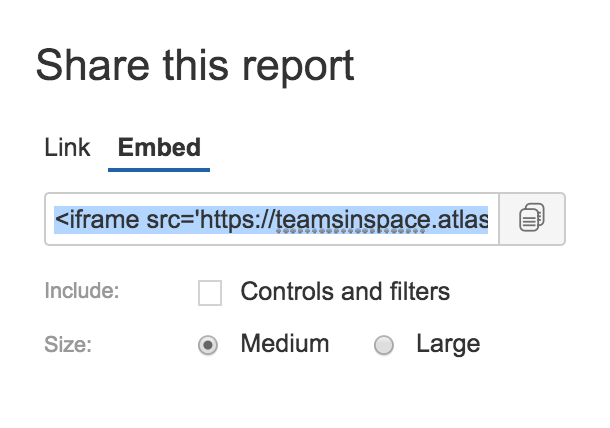 This is handy to ensure that the iframe wraps cleanly around the report, for those times when you don't have the perfect area size for the data that the report returns.